For fans of "The Physick Book of Deliverance Dane "and "A Discovery of Witches" comes a brilliantly imagined debut novel brimming with rich history, suspense, and magic. Revelation Reve Dyer grew up with her grandmother's family stories, stretching back centuries to Reve's ancestors, who founded the town of Hawley Five Corners, Massachusetts. Their history is steeped in secrets, for few outsiders know that an ancient magic runs in the Dyer women's blood, and that Reve is a magician whose powers are all too real. Reve and her husband are world-famous Las Vegas illusionists. They have three lovely young daughters, a beautiful home, and what seems like a charmed life. But Reve's world is shattered when an intruder alters her trick pistol and she accidentally shoots and kills her beloved husband onstage. Fearing for her daughters lives, Reve flees with them to the place she has always felt safest an antiquated farmhouse in the forest of Hawley Five Corners, where the magic of her ancestors reigns, and her oldest friend and first love is the town's chief of police. Here, in the forest, with its undeniable air of enchantment, Reve hopes she and her girls will be protected. Delving into the past for answers, Reve is drawn deeper into her family's legends. What she discovers is "The Hawley Book of the Dead, "an ancient leather-bound journal holding mysterious mythic power. As she pieces together the truth behind the book, Reve will have to shield herself and her daughters against an uncertain, increasingly dangerous fate. For soon it becomes clear that the stranger who upended Reve's life in Las Vegas has followed her to Hawley and that she has something he desperately wants. 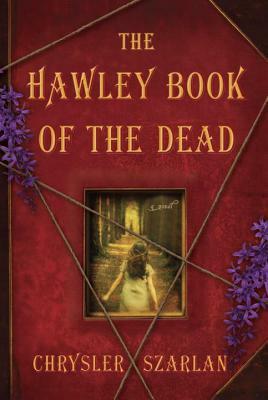 Brimming with rich history, suspense, and magic, "The Hawley Book of the Dead" is a brilliantly imagined debut novel from a riveting new voice. Praise for "The Hawley Book of the Dead"
The core narrative is strong with] a proper hook. . . . The scenes with Reve and her daughters ring true. "Library Journal"
An impressive debut novel that combines various genres seamlessly. "Huntington News"
Engrossing . . . a novel well worth discovering . . . In the vein of authors like Deborah Harkness and Katherine Howe, magic and reality are perfectly blended. "BookPage"
With a rapid pace and exquisite details that clearly set the scene and mood, Chrysler] Szarlan's novel is a great read for those who love fantasy and tales of witchcraft. "Shelf Awareness"
A haunting story of love, loss, family secrets, mysteries, and magic. Lauren Willig. Chrysler Szarlan lives in western Massachusetts with her family, works part-time as a bookseller at the Odyssey Bookshop, and rides her horse in the Hawley Forest whenever possible. An alumna of Marlboro College, she jogged racehorses and worked as a magician s assistant before graduating from law school, after which she worked as a managing attorney with Connecticut Legal Rights Project. She is deep into her next novel of the Revelation Quartet."